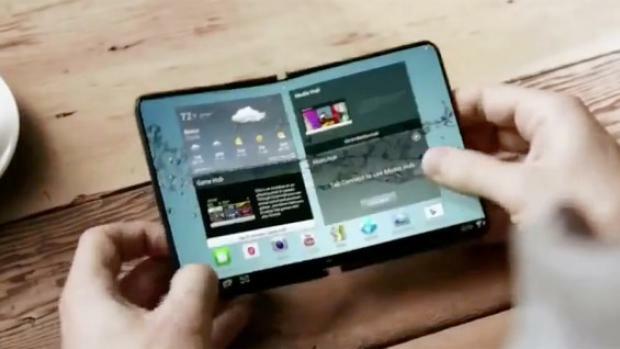 The Samsung Galaxy X was all set to be Samsung’s (and the market’s) first ever foldable smartphone. But this turned out to not be the case; nope, the Galaxy X is apparently now going to be a gaming device. Perhaps the start of an entirely new line of gaming-focussed handsets from Samsung. What does this mean? Simple: In 2019 we’ll see Samsung add at least two new phone lines into the mix – the Galaxy X and the Galaxy F.
How this will jazz with the Galaxy S and Galaxy Note remains to be seen, but all roads lead to at least two new phone lines. And both are gonna be very expensive (more on that in a bit though). With the recent revelation that the much-anticipated Samsung Galaxy X isn’t going to be the long-rumored folding and flexible OLED phone, but instead a phone which focuses on gaming, many have been left scratching their heads about what’s going on. According to new information, the Samsung folding and flexible OLED phone is still happening, but it’ll launch under a different name; the Samsung Galaxy F.
The word comes via reliable Twitter tipster @MMDDJ_ who as well as stating the name change, reiterates that, as per the previous rumours, the handset should launch inside 2019. Samsung Galaxy F Price – Way More Expensive Than Galaxy S10! How much will this foldable beast set you back? Quite a lot, as it goes – and when I say, a lot, I really do mean A LOT. The idea, at least according to the rumors, seems to be for the Galaxy F to replace the Galaxy S10 as Samsung’s flagship, while the Galaxy X will exist as its own, gaming device. The source also added the handset would be “Super High” in terms of its position in Samsung’s range, possibly even being more premium than the Galaxy S and Galaxy Note flagships – which are also rumored to be up for a possible merger into one line. Earlier reports have suggested the Samsung folding phone could be priced as high as $1,850, so this would sit with a “Super High” phone that ranks above the current $800-$1,000+ flagship brands. The next logical question is this: would anyone pay almost $2000 for a Samsung phone? Not unless it could make my drinks, do my taxes, and also drive me around. Apple’s iPhone X, for me, and for most average punters, is just about as expensive as a phone could be – any more is just stupid. I mean, for that money, you could get yourself a brand new, high-end laptop of OLED TV, and you wouldn’t need to replace either of those after a couple of years.